What's Better For Afghanistan's Future: Buddha Tours Or A Copper Mine? : Goats and Soda A vast archaeological site sits atop one of the world's biggest untapped copper deposits. Afghanistan must decide which resource will be a greater boon. What's Better For Afghanistan's Future: Buddha Tours Or A Copper Mine? By the time archaeologists uncovered this statue of the Buddha at Mes Aynak, its head was gone — likely broken off by looters. 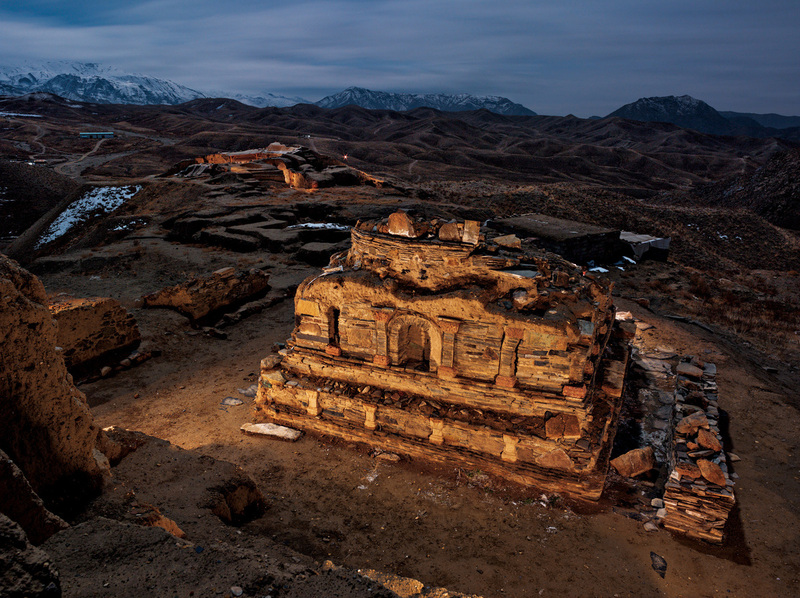 About an hour's drive south of Kabul, there's a vast Buddhist archaeological site dating back at least 1,500 years. It happens to be sitting on top of one of the biggest untapped copper deposits in the world, potentially worth billions of dollars. Eight years ago, the Afghan government made a deal with a Chinese conglomerate to mine the copper, but mining hasn't begun and likely won't for several more years. The area in which the copper is located, Logar Province, presents challenges in both security and infrastructure: no reliable water or power supply, no railway for transporting copper and increasing threats from the Taliban. The U.S. Geological Survey has estimated that Afghanistan holds $1 trillion in mineral wealth but none of it has ever been developed. This could represent a huge and much-needed source of revenue for a country long dependent on foreign aid. But given other countries' experience with the so-called "resource curse," concerns have been raised over whether Afghanistan's natural resources can or will be exploited responsibly. Part of the concern has centered on whether extracting copper at Mes Aynak must result inevitably in the destruction of a spectacular archaeological site that has been compared to Machu Picchu and Pompeii. Historical riches like this, advocates argue, represent a different kind of wealth and could hold the key to a thriving tourism industry in the future. Nearly a hundred ancient Buddhist shrines like this one have been uncovered by archaeologists at Mes Aynak, south of Kabul. Hannah Bloch wrote about Mes Aynak in the September issue of National Geographic magazine and talks to us here. The images in this post are from that issue. It may sound far-fetched now, but keep in mind that tourists think nothing of going to Angkor Wat, and Cambodia was completely ravaged by war just a few decades ago. Tourism is big in Vietnam, too. Afghanistan has breathtaking natural beauty and historic sites. Before all the years of conflict that have come to dominate what we think we know of Afghanistan today, the country was a tourist destination for adventure travelers. It was a must-stop on the "hippie trail" as travelers (many in search of cheap drugs) went overland through Asia, and tourists flocked to Bamiyan to see two colossal, sixth-century statues of the Buddha carved into a cliff face. Those are the statues that were destroyed by the Taliban? The Taliban blew up the Bamiyan Buddhas in March 2001, and even up till then some tourists had been coming to marvel at them. Bamiyan really depended on tourism income, and now it has virtually none. I visited there in December 2013 and saw a few Afghan students roaming around the site where the Buddhas once stood but definitely no tourists. I know this is off the topic of the mine, but could the statues ever be resurrected to bring back tourists? The rubble from the destruction of the Buddhas has all been gathered and saved on site while Afghanistan, UNESCO and the international community try to figure out whether to rebuild the Buddhas or not. Many folks in Bamiyan support rebuilding because they believe it'll help bring tourists back, and the local economy has really taken a beating in their absence for the last 14 years. 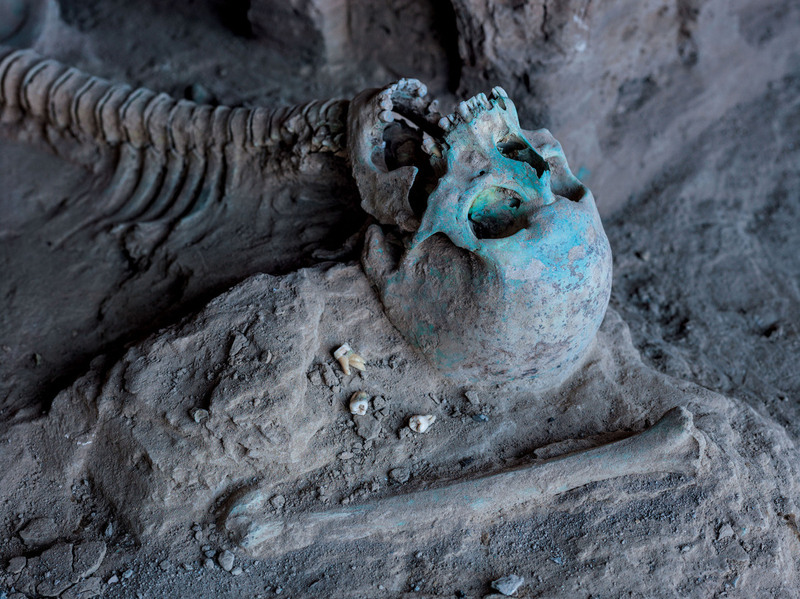 The ground at Mes Aynak is so rich in copper that rock and bones — like this skeleton found lying near a Buddhist shrine — are stained greenish-blue. But there's also a push to keep the niches empty. My own feeling is people would still come. Those empty niches are a powerful reminder of what was once there. But for tourism to start up, a lot will have to change. For now, it's really only safe to get to Bamiyan by plane. Most companies, NGOs and even the Afghan government have forbidden their employees to travel by road because it's so dangerous — it's subject to Taliban roadblocks. So clearly, security is key to any future economic development. Security is the issue that is really going to have to be addressed before there can be any tourism. Or copper mining, for that matter. You mentioned the "resource curse." Part of the curse can be the environmental devastation that results from extracting resources like copper. Is that an issue here? I talked to local activists and researchers who were very concerned about the environmental impact. There's a scarcity of water in the area as it is, and locals think it will only get worse once mining starts. Villagers told Integrity Watch Afghanistan that the water table dropped by 6 feet when preliminary drilling for the mine started. It's a big worry for them — and pollution is, too. They fear the chemicals used in processing copper could percolate through Logar Province's ground into aquifers that are shared with Kabul. There are also worries that once full copper production starts, the mining could generate millions of tons of waste rock and processing byproducts called tailings every year. It's unclear where that would be disposed. Villagers have been hired to help archaeologists with the excavation. 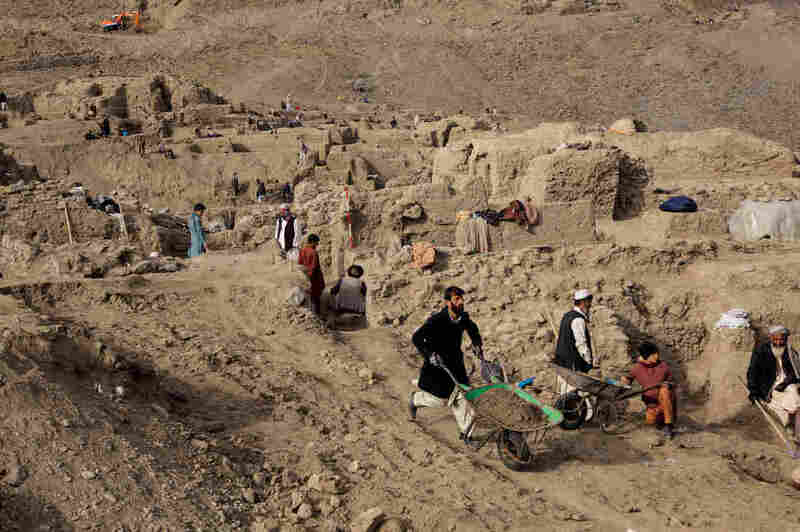 So is it possible to protect the archaeology at a place like Mes Aynak but still have mining? A group of experts examined the issues in 2012 and concluded that the two could occur "in parallel." The World Bank — which has been supporting both Mes Aynak's archaeology and the prospective mine with millions of dollars in grants — seems to think both mining and heritage protection are possible. But probably easier said than done. It strikes me as unfair when outsiders want to begrudge Afghanistan the right to exploit and benefit from its own tremendous mineral wealth. And some of the foreign archaeologists I spoke with understood that very well and felt it was not their place to say Afghanistan should forgo a mine in favor of cultural heritage. But others, especially some of the Afghan archaeologists I met, felt very strongly that Mes Aynak should be studied and preserved and there should be absolutely no mining. The copper is going to run out someday, they said, but the statues are forever. The part of the site that they've been concentrating on, which is yielding an incredible wealth of finds, would be completely destroyed by a mine. Hannah Bloch's story on Mes Aynak appears in the September issue of National Geographic. I guess the irony is that none of the archaeology would be going on if there were no prospect of a mine. It's the threat of the mine that galvanized the cultural heritage community to demand that the site be properly excavated and recorded to the extent possible. And the World Bank has poured a lot of money into the effort. At first the archaeologists were rushing to do their work because they were given a quick deadline, but there have been so many delays to starting the mine that it's worked to the advantage of the archaeology. Mes Aynak was already being looted before 2007 and if there were no archaeology (and no prospect of a mine), it seems likely the place would be destroyed by looting. That's a problem at a number of Afghan sites. 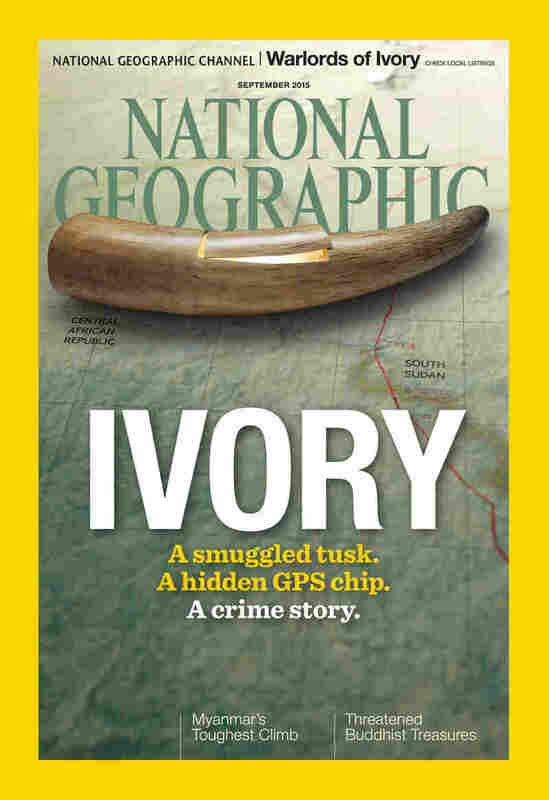 The thing to remember, too, is that archaeology is by its very nature a destructive science. The Society for American Archaeology says, "Once a site is excavated it is gone forever." 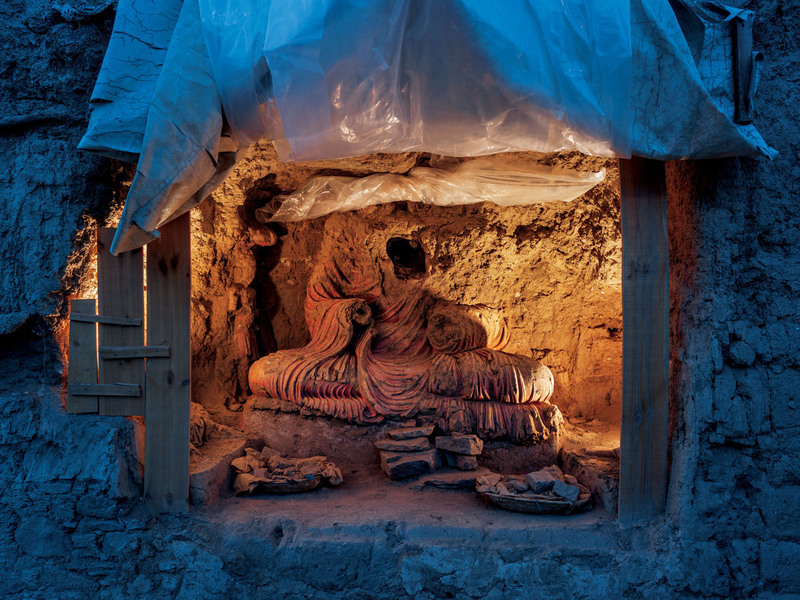 So the only way to really preserve a place like Mes Aynak would be to keep it completely untouched. That doesn't seem like an option. No, especially since the archaeology is already well underway — and keeping it untouched means everything they're finding would never have the chance to be appreciated by anybody. But maybe it's worth remembering that the Buddha taught his followers that change is inevitable and not to be attached to material objects. The archaeologists at Mes Aynak are definitely attached, understandably, to what they're digging up, but the notion of impermanence doesn't really escape them, either. A Tajik archaeologist said to me: "All of us are only guests in this world." And what's the prevailing wisdom in government circles: mining or tourism? It depends whom you ask. Mining is widely seen as a potential "backbone" for the economy, so there's a lot of acknowledgment of the huge role it can play. But there's pride in Afghan heritage, too, and a mining minister from the previous Afghan government told me the government was learning a lot about how best to proceed through this experience with Mes Aynak. The current president, Ashraf Ghani, is actually an anthropologist by training and made a point of visiting the archaeological site at Mes Aynak back in the winter. I was told by a former culture ministry official that tourism was the second-largest source of income for Afghanistan in the 1970s. He told me now he wants to see the country's first income be from tourism and he does believe tourism is going to the answer in the long term. It's not just ancient history they're finding at Mes Aynak, right? The area has a dramatic recent history as well. Right. The 9/11 Commission reported that Mes Aynak was the site of an elite al-Qaida training camp in the 1990s. Four of the 9/11 hijackers were trained right there. I was taken by one of the archaeologists to visit a cave that was used as part of the camp. He took me through it as if it were an ancient site — and it did look pretty rough. The ceiling was blackened. He said it was from a U.S. firebomb in late 2001. He pointed out a pen where the fighters kept their livestock, the stone slab "sofa" they sat on and slept on, the place where they stored their food. It was very strange to put such a recent and horrifying set of events into historical context like this, but he said to me, "This, too, is a kind of archaeology." It made me wonder what archaeologists of the future are going to study in Afghanistan and what kind of Afghanistan those archaeologists will be working in — a peaceful, prosperous tourist destination where Mes Aynak is a household name and a place that's easy to visit, like Pompeii today? Or someplace violent and fractious and facing an uncertain future? I hope it's the former.